The communication between the Wi-Fi subnet and Tor requires several adjustments of the network configuration. To begin, open the /etc/sysctl.conf file and append the directive net.ipv4.ip_forward=1 at the end. Then, activate the change by issuing sysctl -p.
The next step addresses the need for modifying the rules for iptables. You should first delete already existing rules using the commands iptables -F and iptables -t nat -F. You can then activate the new rules, which are shown in Listing 5, and immediately save them in the file /etc/iptables.ipv4.nat. Finally, open the /etc/network/interfaces file and append an empty line and the entry up iptables-restore /etc/iptables.ipv4.nat. This step instructs the system to process the rules on subsequent reboots. The /etc/tor/torrc file contains the Tor configuration information. Directly following the line ##https://www.torproject.org/docs/faq#torrc, add the text from Listing 6. You should also create a log file (Listing 7) so that Tor has a place to record its messages. Finally, you can start Tor by invoking service tor start. By issuing the command update-rc.d tor enable, you ensure that this service also starts up automatically after a reboot. To use Tor from now on, you just need to register the device of your choice with the new Wi-Fi network. You can check whether this arrangement works as intended by calling up the web page https://check.torproject.org. In case of success, you will see the message Congratulations. 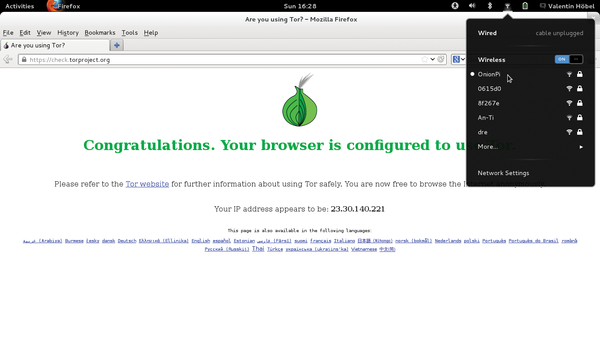 Your browser is configured to use Tor (Figure 4). Figure 4: The website check.torproject.org checks whether your system is properly connected to the Tor network..